Initially it was expected that all the aerodromes of the USSR can receive the shuttle, but quickly the authorities realized that was impossible because the shuttle could have to land apart from the territory. There were then 2 solutions: increasing the number of aerodromes (but Buran was a military object, the strategic allies were laid out too closer to the borders of the USSR, whereas Cuba was too close to the adversary territory), or to increase the operating range by the addition of turbojets. It is the second solution which was chosen by the engineers. it was necessary to transform the turbojets to not be deteriorate during the ascent, and to resist the influence of the factors of the space flight (the space vacuum, differences in temperatures, etc). 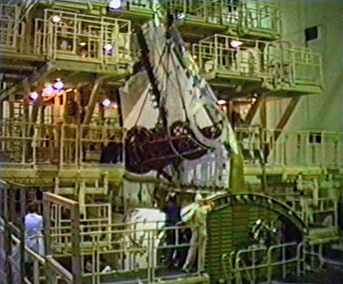 there were problems to ignite the engines at high speeds in the dense layers of the atmosphere (required to overfeed them out of oxygen) during the return of the shuttle after a space flight. 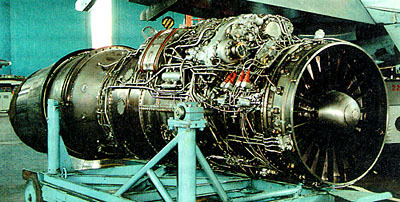 the presence on-board of 2 aviation turbojets required many additions (storage of fuel on-board, development of the systems of control of the engines, extinguishers, etc), the ponderal overload of this system and the modification of the shuttle gravity centre made that its effectiveness was decreased. The resolution of all the problems, just as the development of the turbojets, increased importantly the cost of the project, and conduct in too much complexity of the on-board systems and increased project delay. Their use was thus initially abandoned. 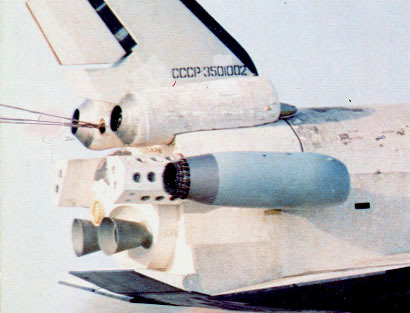 In order to test the 2 Buran turbojets (out the re-entry phase) they were installed on the atmospheric similar plane BTS-002 (Large Ship of Transport 2 for the Tests of Flight). They were placed in special protection sheaths included in the fuselage, closed by lids and covered by the heat shield. on the left the envelope, on the right the carcass (rigidifying structure). As the test routine of the analogue-plane BTS-002 was envisaged to takeoff normally, from an aerodrome like a plane, but that the 2 turbojets ТРД АЛ-31 (2x7770 kg) was not enough powerful, the engineers then added 2 other turbojets ТРД АЛ-31Ф (2х12500 kg) on both sides of the fuselage, and also created a light cambering of the shuttle to reduce its weight on takeoff (the height of the main landing gear having been increased). preparation to the flight on the left, side view in the middle, rear view on the right. 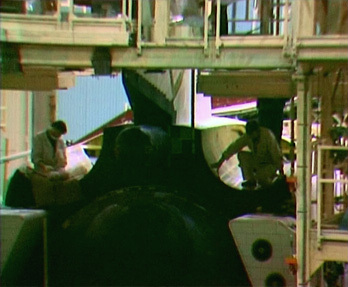 For the first flight of Buran the turbojets АЛ-31 were not still ready. 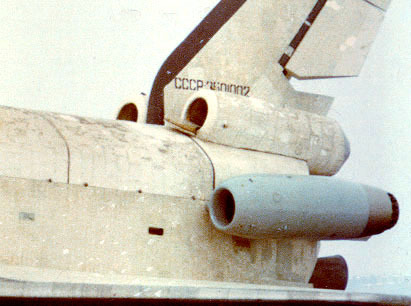 Due to the delay of manufacturing the turbojets, bulges with the back of the shuttle were filled by a layer of the heat shield. 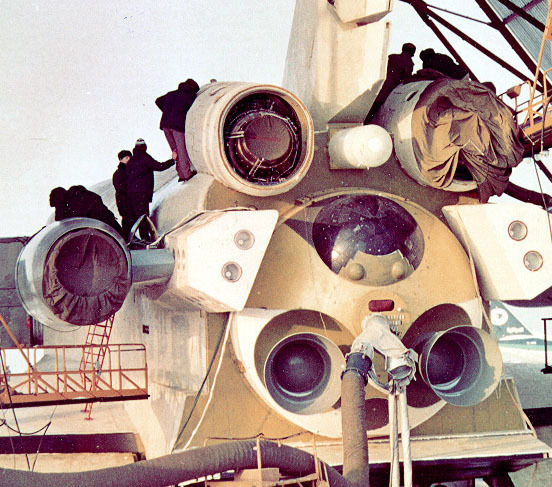 The shrinking of the engines of Buran required new tests in wind tunnel (modification of the air flow on the payload bay and the tail) and required small developments (the aerodynamic constraints increased on the drift and the centre of gravity moved). 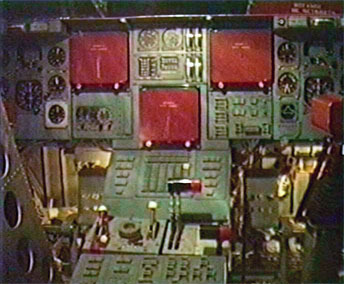 The absence of the turbojets did not involve changes inside the shuttle, this is why the control board of the turbojets (between the central desk and the dashboard panel N5) between the sieges of the pilots remained in place for the first flight of the shuttle. The first flight and the descent took place well even without the engine, asked the question of their installation for later flights. 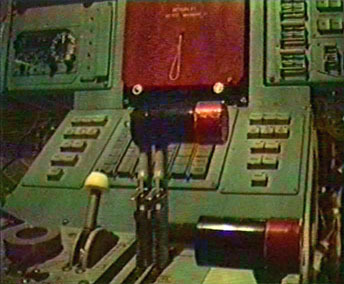 But in the future, to increase the maneuverability of the shuttle during the descent, the engines could completely be installed, according to I Sadovsky.